The Midway Hollow Crime Watch is an organization of volunteers and members that are committed to increasing the safety of our neighborhood by reducing crime. Our best tool is the Expanded Neighborhood Patrol (ENP), which allows the Midway Hollow Crime Watch to hire the Dallas Police Department for dedicated, extra patrols exclusive to our neighborhood. During these patrol hours, Dallas Police Officers will safeguard Midway Hollow only, and will not take calls outside of our boundaries. Our officers will also respond immediately to 911 calls and home burglary alarms in Midway Hollow. Before Midway Hollow participated in the ENP program just a few years ago, we would have as many as 50 offenses each month in our neighborhood. Today, we average 10 or fewer offenses. We also see significant drops in crime each time we’re able to raise the number of weekly ENP hours. Our goal is to purchase 80 dedicated patrol hours per week, however, the number of hours that we are able to purchase depends on the number of paying Midway Hollow Crime Watch members we consistently maintain each membership session. Over 95% of the dues we collect goes directly to purchasing additional patrol hours from the Dallas Police Department. Midway Hollow Crime Watch dues are only $150 per 6-month billing period ($112.50 for seniors 65+). That’s just 82 cents per day! Our billing periods are April 1st – September 30th, and October 1st – March 31st, but you can join at any time! For more details, please download the Midway Hollow Crime Watch Flyer or sign-up today by clicking the “Pay Membership Dues” link at the top of the page. 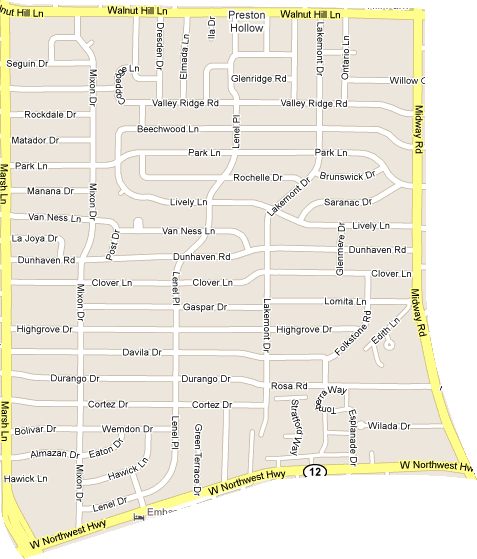 The boundaries of the Midway Hollow Crime Watch are very broad and include over 2,300 homes. Midway Hollow stretches from Walnut Hill Lane to Northwest Highway, and Midway Road to Marsh Lane.